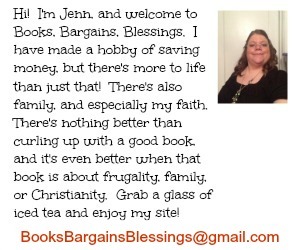 Books, Bargains, Blessings: Someone tried cheating in a blog giveaway! Someone tried cheating in a blog giveaway! Last week, I arrived in the house late one evening. My husband and I had been at foster / adoptive parent training and I decided to check my e-mail and a few things online before heading to bed. I refreshed my blog, and it showed that I had over 4,000 entries to my iTunes giveaway, yet for the one for the Paparazzi bracelet, it had about 20 entries. I thought to myself, "I thought for sure I had that to show entrants, not entries." So I went to Giveaway Tools, and amazingly, I did have it to entrants. During the time my husband and I were at class, over 3800 fake names were used to enter my giveaway -- over 12,000 fake entries. Eventually Giveaway Tools DID sort out the fake entries (this is why if you are a blogger, you should use the filter by IP address.) Interestingly, even though there were that many entries on my giveaway, blogger was only showing there were 400 hits total on my post, which seemed about right. They all came from out of the USA even though it was only open to USA residents. They all came within a few minutes of each other. The only entries that were done on all 3800 accounts were the "free daily entry" and visiting Facebook pages. Last night when Giveaway Tools selected the winner, I was so relieved to see I recognized the name. The lady who won blogs. I don't know her, but I was so relieved to see that even though someone tried to compromise the integrity of my blog giveaway they were unable to do so. So there you have the details of what happened. I love to run giveaways, so I hope you'll like my Facebook page and follow me on Pinterest as well as sign up for my free newsletter.. Sorry that you had to deal with the cheaters. They are everywhere. Glad you caught the cheater! Me too! I have a smaller blog and as soon as I saw those numbers, I knew they couldn't be right! Annoying is what it was. It was a $10 iTunes card -- which you know! :) If the person who spent all the time creating the bot would have put his/her time towards something useful. . . smh. I was glad to see your name was picked by Giveaway Tools as the winner. I actually breathed a sigh of relief when I saw a name I recognized! I hope there is a way to stop that from happening in the future - sounds like some king of a bot. Yes, I'm sure it was a bot. I am not quite sure why they weren't filtered out instantly, but Giveaway tools did filter them out. The only bad part was I was asking a question in the giveaway for a future blog post series, and Giveaway tools didn't delete the entries on my end, just disqualified them. So those entries are in the middle of legit entires, if that makes any sense. I'm so happy that you cared enough to investigate! It makes reading your blog and entering any contests even more enjoyable. Shame on those who try to take the fun out of things by cheating. I always wonder when you see 3000 entries and the first one is mandatory comment on blog.. And you post your comment and there are less than 10 responses. I'm tired of cheaters, I am ready to start winning again. I agree. I miss the days of being able to win more often. 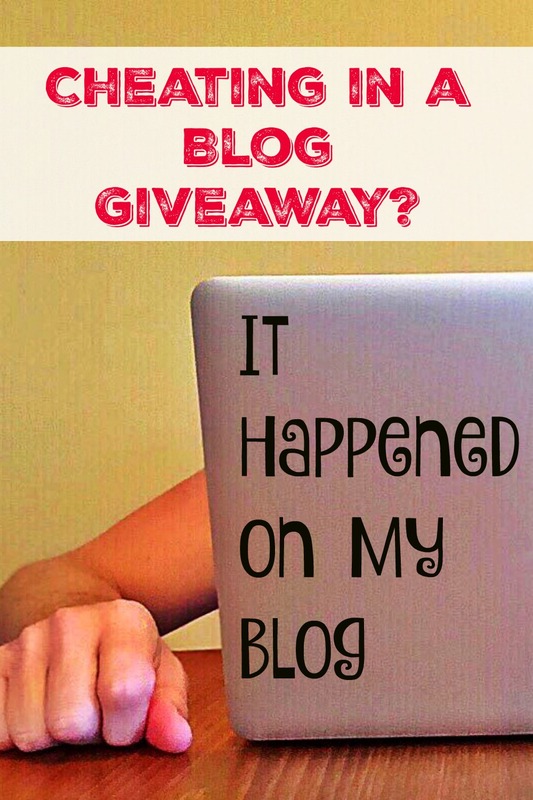 I have always loved entering blog giveaways and I just hope others who host them are as diligent as I am about making sure no one cheats! Glad you were able to catch that in time!! Super glad you caught the cheating! I have been doing giveaways since the summer of 2009 and while it is time consuming, I would never resort to cheating to win. It really ruins it for the rest of us. I wish people could be more honest. :( Have a great day! Thank you for caring to check. This cheating is way out of control and i am sick of it. It is nice to see the bloggers like you, who are checking. Thank you! 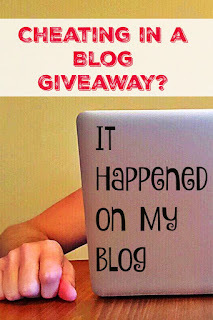 When I have a giveaway on my blog I always check for cheaters. If they lied about one of their entries than I delete all their entries. I see a lot of blog owners who don't check though. Like if there is a mandatory comment as the first entry and only about 4 comments and yet there are hundreds of entries.